Since tfung’s parents came into town, we decided to bring them to some of our favourite spots. On the second night, we brought them to the newly renovated Bouillon Bilk. I was quite excited to see their new decor, since I had caught a glimpse of it whilst walking back to the Grand Prix on Saint Laurent, and it had looked incredibly sleek and modern. 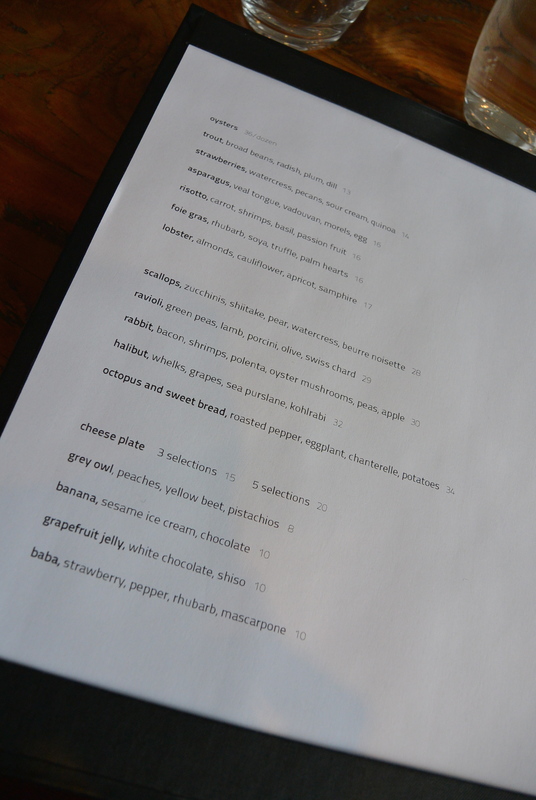 The menu had changed quite a bit since I was last here, but definitely still had the flair of the old Bouillon Bilk. 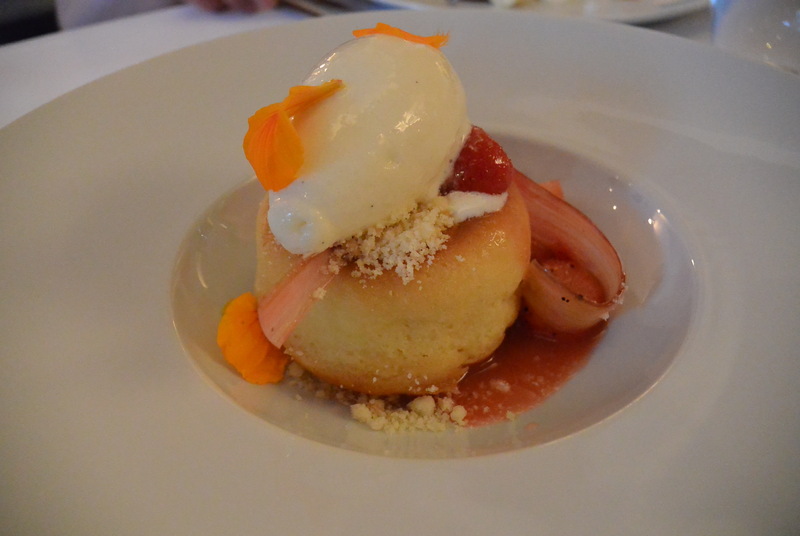 They had refreshed the menu for the summer, which was great to see, and the desserts were completely new. I started off with the linguine which was one of the specials. The pasta was done a little over al dente, a consistency I like, and was mixed in a buttery sauce that had hints of seafood flavours. Along with the linguine were chanterelle mushrooms, and garnish. 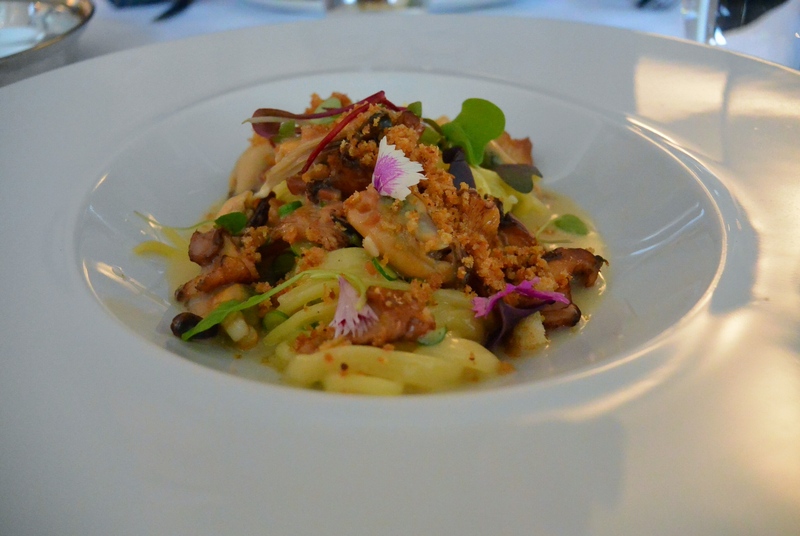 Definitely a great dish on its own, I thought they were able to bring out the flavour of the chanterelle mushrooms well, without overpowering the sauce and the linguine. The slight crunch in the mushroom and its lighter consistency was a good contrast to the firmer, denser texture of the linguine. As for tfung, he started off with the asparagus appetizer, which came with asparagus purée. It was also served with veal tongue and a sunny-side up egg on top. 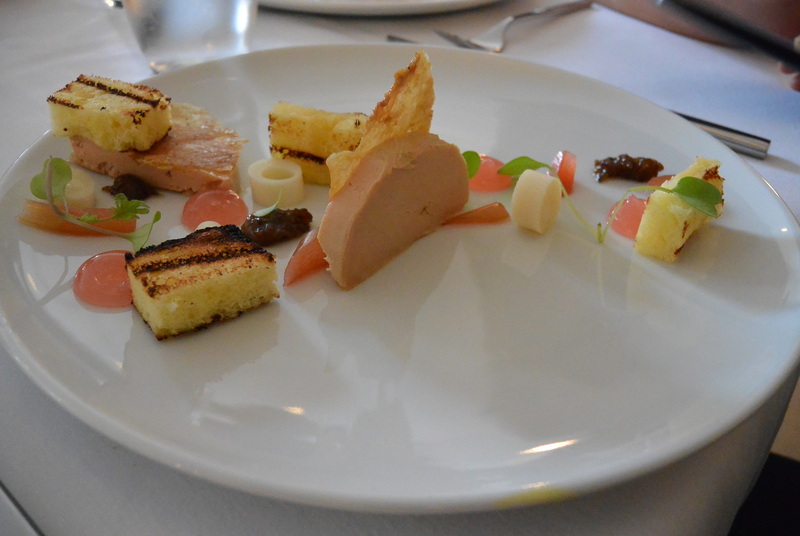 To start, the presentation of this dish was fantastic. The purées were arranged nicely and was sprinkled with micro greens. The veal tongue was cooked very nicely. It was soft, but still had firmness in its texture. It was not overseasoned, but rather seasoned conservatively with salt just to bring out the natural flavours of the meat. Pairing it with the asparagus puree gave it that summer freshness that it needed. 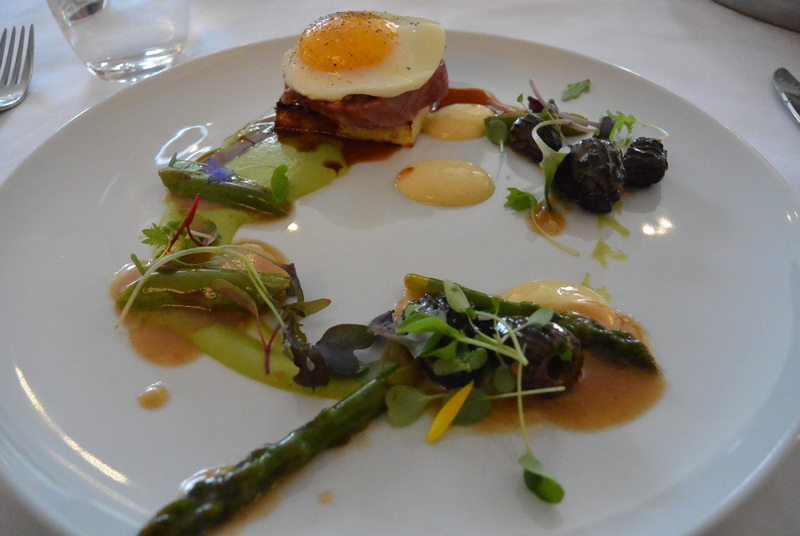 The egg on top was a nice addition to the dish, providing a bit more sustenance and flavour to the veal tongue. 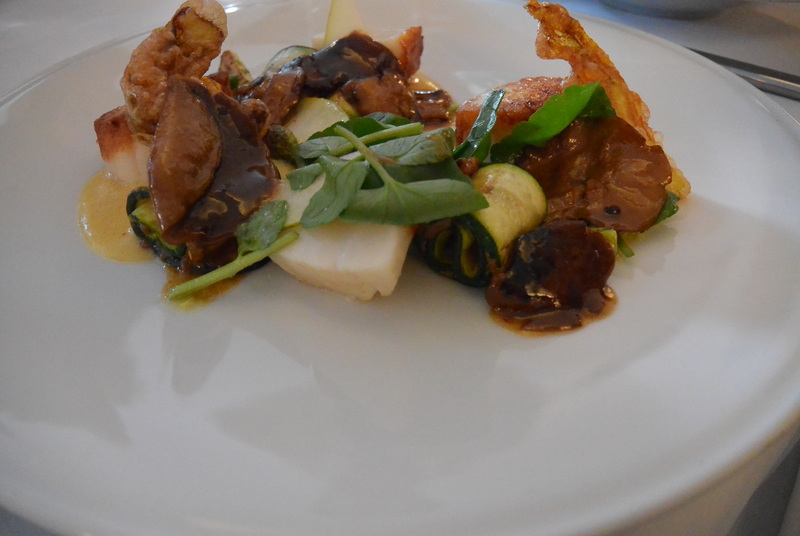 Adding the rich and earthy morel mushrooms was also a nice touch. 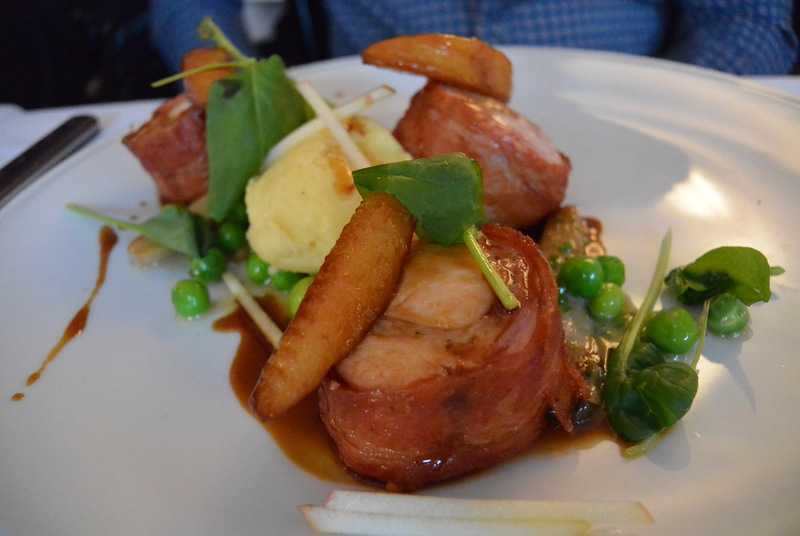 Overall a very good dish in terms of presentation, creativity and combinations of flavours. 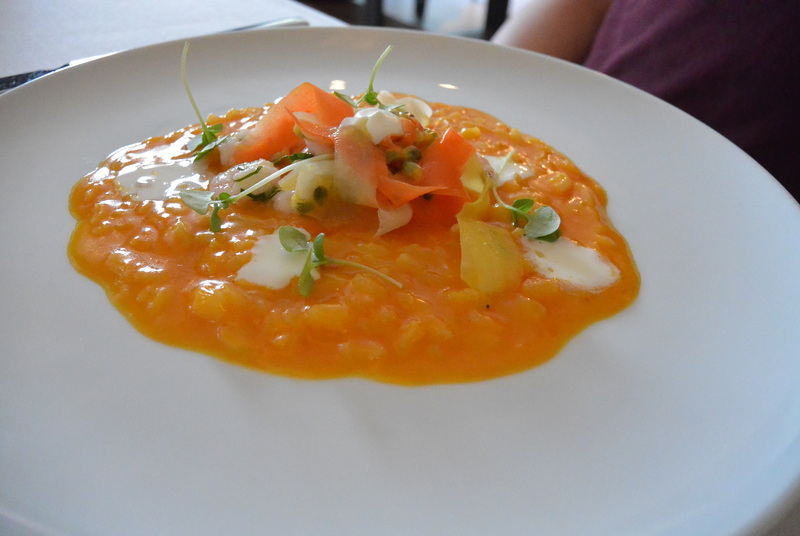 I was able to taste a bit of the carrot risotto, and let me say this: definition of summer. I love how they’ve (in my opinion) a seemingly boring and over-done dish and freshened its colour and its flavour to fit the heat. The carrot base in the sauce of the risotto was light and slightly sweet. It was definitely a good start to the meal. 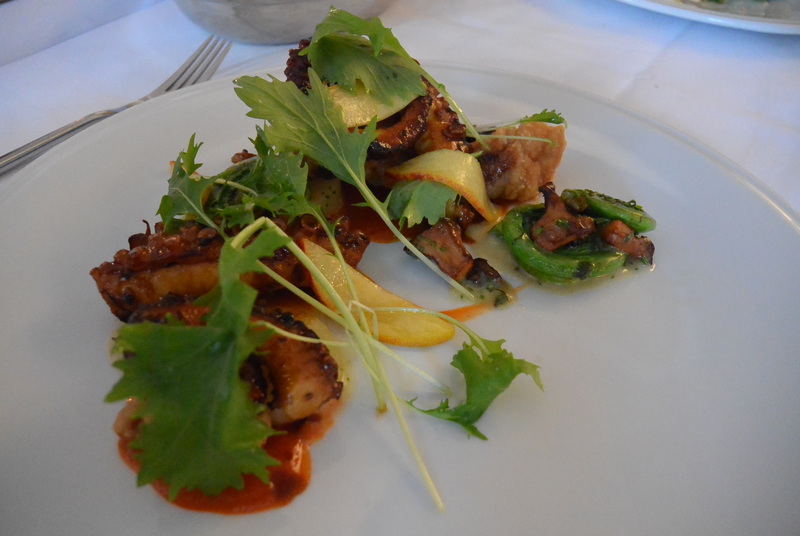 For me, I ordered the octopus with sweetbread. 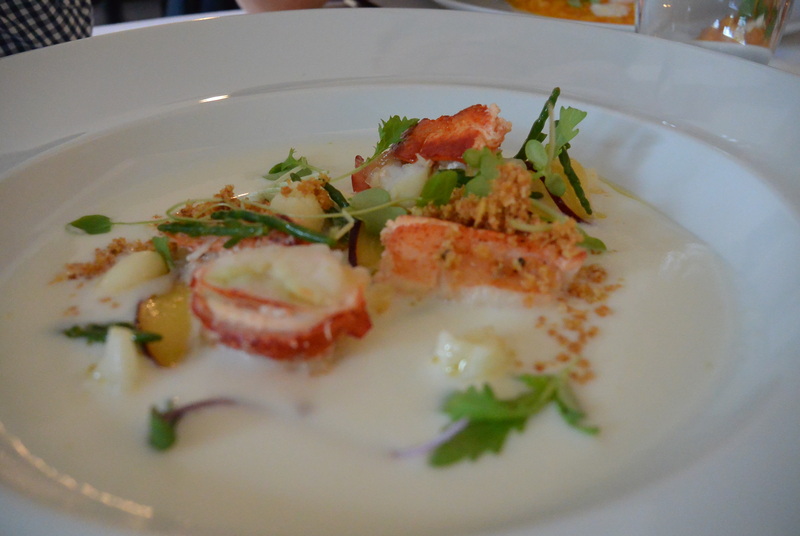 This was definitely the priciest of the dishes, but well worth it. The octopus was done to perfection: enough texture and chewiness on the inside without being difficult to chew, while retaining its true octopus taste; crispy on the outside, with an ever so slight smokey taste. The contrast in the texture and the flavour was great. The sweetbread was fried on the outside with a light batter, and retained a soft texture on the inside without overcooking it to a mushy consistency. To go with the fried sweetbread was a sour and slightly spicy, sriracha-based sauce. 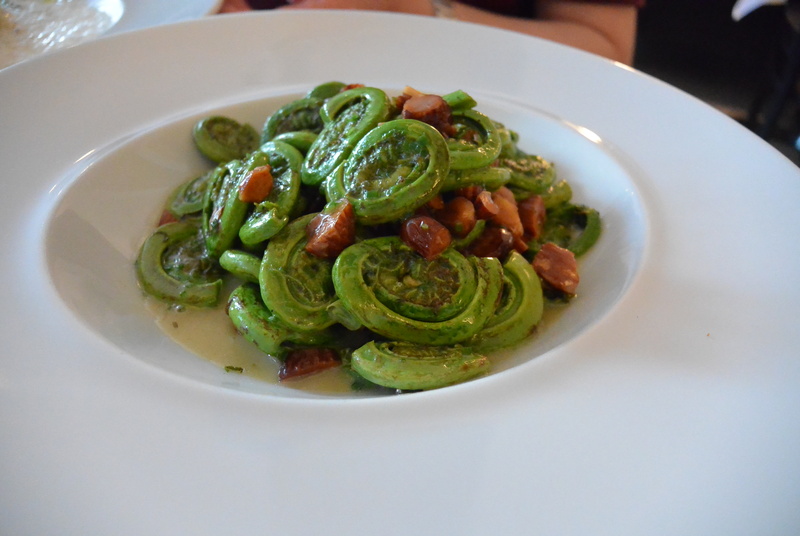 Finally, fiddleheads, mushroom and sliced pear as sides along with some greens for garnish. The rabbit was roasted perfectly. It was soft, tender and juicy. Wrapping the rabbit with bacon wasn’t really necessary as the rabbit was tasty enough, but the bacon certainly enhanced the flavour. It was served with a rabbit au jus that was sweet and savory, which complimented the rabbit well. 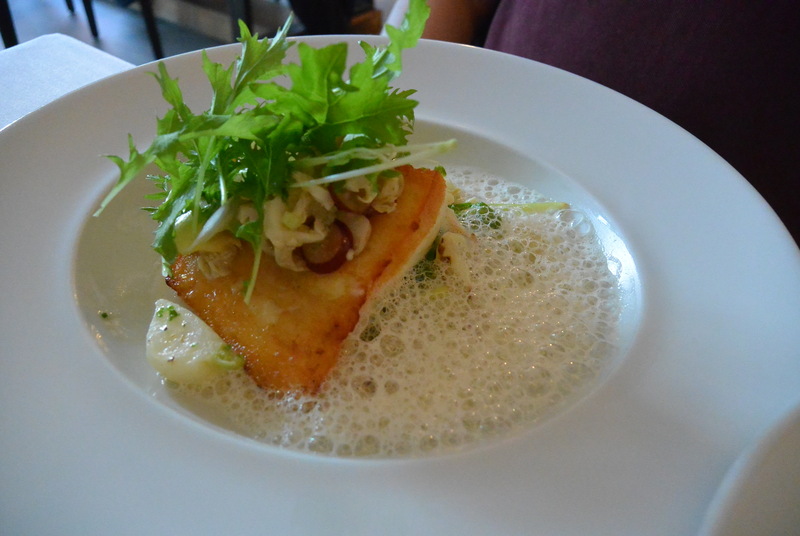 Overall, Bouillon Bilk had given me a refresh in terms of modern dining. I thought they did an excellent job in balancing delicacy with creativity and thinking outside the box. They were innovative, yet still incorporated elements according to the season, which I believe is crucial for a more modern dining experience. As delicious as a heavy truffle cream gnocchi is, it just isn’t as enjoyable in the heat of the summer. The service was quite good, not outstanding for the calibre of restaurant it is. The decor was absolutely stunning. I love the bar in the middle, creating a more relaxed feel, especially for the younger clientele. There were three longer tables that were of higher elevation (a very popular setting now), which I personally love, but is not for everyone. Their washroom is extremely modern, with the style of communal hand washing station in front of 3-4 individual rooms solely for the toilet. This may not sit well with more traditional folks, but for me, I absolutely love it. I highly recommend you to come try their summer menu. Make sure to make a reservation, and let them know of any delay or cancellations!